Description: the miniature Stegosaurus is basically coloured in four layers. The lowest layer (the belly, throat, most of the lower jaw and underside of the tail) is painted light grey. Above that, the second layer is white, covering the legs, flanks and both sides of the tail. A number of grey spots and stripes adorns the white parts of the figure. The top layer is coloured black, covering the creature's back, upper jaw, top of the tail, and most notably, the plates and tail spikes. In-between the white and black parts of the Stegosaurus there's the final layer, an orange line on either flank of the figure, running from the neck to the end of the tail, ending just under the last set of plates. The eyes are yellow with black pupils and a black JP III logo can be found on its left back leg. The animal stands in an active posture, with its body bent and its tail dangerously sticking out, like it’s defending itself from an aggressor. That aggressor could be the Spinosaurus that completes this 2-pack. It stands in a walking posture, with its left leg posed forward and the left arm raised, its mouth opened as if roaring and the end of the tail bent pointing to the right. It sports a mostly light blue paint job, which gradually turns into black on the animal's back, neck and upper parts of the tail and head, and dark grey on its belly, throat, inner side of the legs and lower part of the tail. It has a row of orange stripes on either side of its sail. Its claws are painted black (something they did not bother to do with the Stegosaurus), and it has yellow eyes with black pupils, white teeth and the inside of the mouth is coloured bloody red. A black JP III logo is found on its right upper leg. 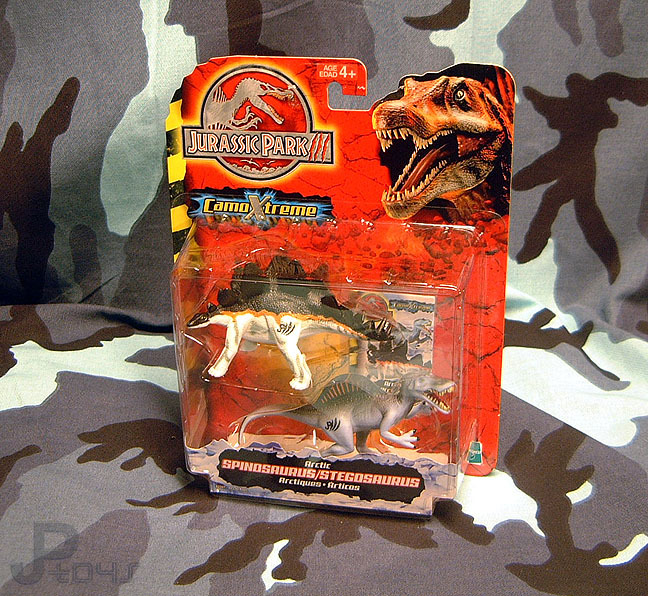 Analysis: Hasbro's long time affinity with dinosaur 2-packs started with the CamoXtreme line, which delivered some of the very few actually appealing 2-packs ever produced. This Arctic 2-pack is among those. Though the Stegosaurus lacks some detail (unpainted claws, spikes and even plates), both figures sport an interesting paint job which very well might help them blend in in an icy environment (except for the orange highlights maybe). Aside from the paint jobs, there is little else to warrant attention to this pack. Both figures are nothing new and have zero playability options. The Spinosaurus is still a decently realistic miniature figure, which in a lesser regard applies to the Stegosaurus as well, though its front legs are still overly long compared to its hind legs and it has a rather goofy expression on its face. Repaint: yes. Both figures were originally featured in the JP III toy line. The Spinosaurus came with Amanda Kirby in Wave I of that line, while the Stegosaurus had to wait for release until Wave II when it was paired with Amanda's (ex-)husband Paul Kirby. The Spinosaurus would be repainted several times again for JP Dinosaurs 2/3 and JP 2009. The Stegosaurus would only be repainted for JP Dinosaurs 2/3: interestingly enough, this Arctic Stegosaurus would be reused in its entirety (so no additional paint work at all) for the JP Dinosaurs 2 'Electronic Brachiosaurus with Micro Stegosaurus' set. Overall rating: 7/10. Nice paint jobs and a funky collector's card are the only attraction in this set, unless you don't own the original JP III sculpts yet. The CamoXtreme 2-packs are a bit harder to find than most other Hasbro JP dinosaur 2-packs, but not (yet) excessively so. You can still find them irregularly on eBay for a fair price. These 2-packs were imported in the Benelux in decent quantities, making them also fairly easy to find there.